During the 1920s Christian Waller became a leading book illustrator, winning acclaim as the first Australian artist to illustrate Alice in Wonderland (1924). Her work reflected Classical, Medieval, Pre-Raphaelite and Art Nouveau influences. She also produced woodcuts and linocuts, including fine bookplates. From about 1928 she designed stained-glass windows. The Wallers travelled to London in 1929 to investigate the manufacture of stained glass at Whall & Whall Ltd’s premises. They also visited Ireland to meet the mystic writers Lord Edward Dunsany and ‘A.E.’ (G. W. Russell). Returning to Australia via Italy, they studied the mosaics at Ravenna and Venice. Christian signed and exhibited her work under her maiden name until 1930, but thereafter used her married name. 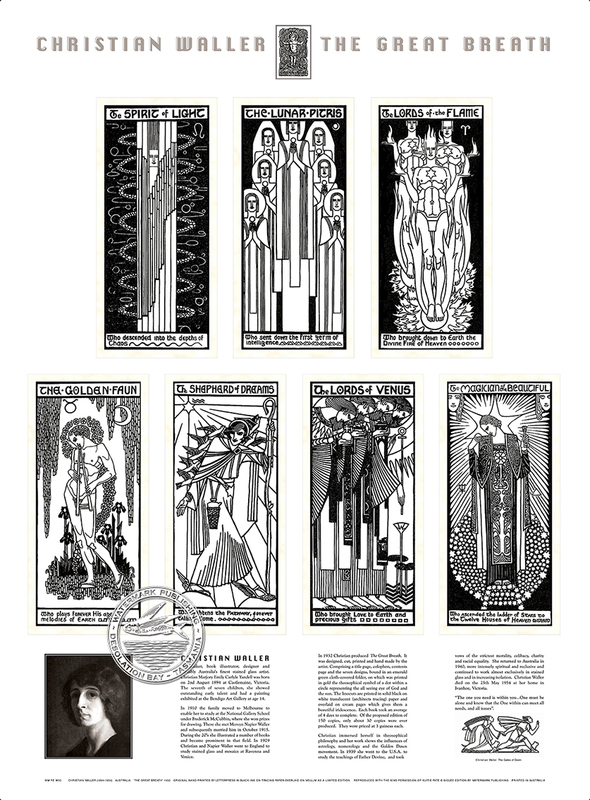 In the 1930s Waller produced her finest prints, book designs and stained glass, her work being more Art Deco in style and showing her interest in theosophy. Her art and writing featured in Manuscripts, edited and published by H. T. Miller. Using the 1849 press she owned with her husband, in 1932 she designed, cut, and hand printed The Great Breath: A Book of Seven Designs, her best printed work. A copy, purchased by the National Gallery of Victoria in the year it was published, was her first work to enter a public collection. Her illustrated fairy tale, The Gates of Dawn, also appeared in 1932. She created stained-glass windows for a number of churches, especially for those designed by Louis Williams, in Melbourne, Geelong, and rural centres in New South Wales. Sometimes she collaborated with her husband, both being recognized as among Australia’s leading stained-glass artists.